Home→Telecoms→Why don’t device manufacturers complain about ‘Over The Top’ ? Why don’t device manufacturers complain about ‘Over The Top’ ? 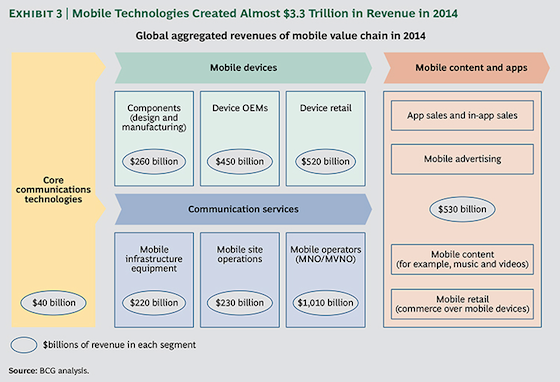 I just came across this nice summary of global market revenues associated with mobile technology, courtesy of BCG. $3.3 trillion in 2014. What struck me (by virtual of the two-dimensional layout rather than a typical one-dimensional value-chain diagram) was that the $530 billion mobile content and apps market – generally seen as freeloading “over the top” services by mobile operators, depends on both communication services ($1 trillion of spend) and mobile devices ($520 billion of spend). Communication device players don’t complain about how ‘OTT’ demand is driving them to develop newer and better products with more storage, faster CPUs, etc. People shrug their shoulders at non device neutral strategies (Apple…) and get all heated up at the mere thought of (probably impractical) non network neutral strategies. Just sayin’… Get the business model right and things get a lot simpler. Are OTTs making networking unsustainable? 1) the chart is disingenuous as to scale and so the reality cuts against your headline. The chart makes the $530 billion appear to be ~40%, whereas the actual ratio is ~16%. b) the lack of bilateral or balanced settlements both north/south as well as east/west in the model. We (the trade and capital markets) need to address both issues simultaneously. The growth we’ve witnessed over the past 30 years (wireless and packet based) is as much a “catch-up” to technology innovation that had been occurring before “open access” satisfying latent demand, as well as new technologies and demand models. 4) As we look to a future (all possible at scale today) of 4K VoD, 2-way HD collaboration, mobile first, and IoT trends we see that the current (vertical) business models at the edge access boundaries and policy (lack of ubiquitous, mandated equal access at the edge, particularly wireless) are not conducive to efficient service creation. Hi Michael. Thanks for the comments. You are right that the chart is not to scale. However, the revenues are not all end-user spend either – there is a value chain issue here so that (for example) the $230B revenues of site operations are a cost to the $1T mobile operator business. So I think we *can* compare $530B of ‘OTT’ against $1T of ‘MNO’ end-user spend. That said, your points are an excellent commentary on where the business model elements are failing. My point was exactly that: the “OTT complaints” are a symptom of a failed business model.